A package arrived at the K&G headquarters today from Mythic Entertainment. Opening the package revealed something very unexpected…. After the eerie music and mental image of Josh Drescher cutting our hair with a scary smile on his face faded from our minds, the gears began to turn as to what the contents of this package could represent. What do you think? Do these hair care products foreshadow fluff on the way to Warhammer Online…. or do Graev and I need to be afraid of what’s to come on January 29th? Could this be a clue that the Dwarf Slayer is on the way?! Wow, if they introduced slayers, then this game is going to need more oil because the gears are about to grind even more. The hair option seems a little too obvious. Why would they go out of their way to spend money to say “hair changes” when a letter saying, “hair changes” would do. Besides, i don’t care about my hair. There could be cuts coming soon. Nerfs? I think it will be the announcement of Slayers. Though, they are probably 3 months away from being added through an event. Still, it is one of the classes that has been widely requested (by those ale guzzling Dwarves) and will hopefully make it in. I wonder how they will change the lore. The slayers duty is to go into the world and find bigger and bigger challenges until they finally die to one. I doubt they will institute perma-death for this classs, so it will be interesting to see how they are allowed to tweak the lore just a bit to cover over this little quirk due to being a game. WAR’s whole resurrection thing isn’t in the lore anyway mate, so they will probably just ignore it. Really we’ve already got loads of tweaks to the lore, Swordmasters/Blackguards using shields, Squig Herders being totally different, male Sorcerers, etc, etc. It has got to be the announcement of the slayer (which would be awesome). The Mythic team seems like such a great group of fun loving guys and gals. The kind of people that would be cool to hang out with and have a beer or two. Mythic taking the time to do that… awesome. Could the hair cut kit be related to the Choppa or another class on the way? I’m thinking that perhaps Mythic meant the Orange hair for the Slayer and the hair cut kit for another class… or maybe both for the Slayer. Any lore junkies out there know anything about Choppas and hair clippers? Whatever it means, the WAR devs really got a sense of humour. I hope you used the items properly, I’m awaiting pictures of a orange mohawk. Lore whore reporting for duty sah! Orcs dont grow hair at all (tho some crazy ones use hair squigs to pretend they have beards…), so nah it’s nothing to do with the Choppa. Orc choppa is just a basic warrior type Orc, no fancy background or anything. Since taking the slayer oath means shaving your hair into a mohican and then dying it orange, think you’ve got the answer there mate. What would be cool would be the option to have any dwarven character do a quest and turn into some sort of hybrid slayer class like engineer/slayer with 1/2 new abilities. Well, even those these items is related to Slay Oath, you may think it is because Mythic committed a great shameful act by making the endgame so … unpopular, and all their staff are going to become Slayers to regain their honour as developer of RvR MMORPGs. Bug Slayers, Bad Design Slayers, Wrong Itemization Slayers, Hippy High Elves Slayers…. Slayers look a certainty tbh. Little to none Retcon work is needed to get slayers in. Slayer were a playable class for many years in warhammer quest (a GW version of D&D). As for the reaction to death in the lore it very simple: they ignore it. Resurrection of any kind isn’t part of the warhammer lore. As for how a character would deal with this idea, i don’t think a slayer would mind at all tbh. After all there duty isn’t to die its to atone. A slayer would just see it as a chance to kill more monsters. the biggest problem isn’t death but running away. after all the one skill every class in the game has is Flee and that is the one thing a slayer would never do. still im hoping with this confirmed we might get a decent new class for destruction as well in the shape of savage orcs. but ill leave the justification of that line of thought for my blog since this post is getting long already! If Slayer had been in the game on launch, I would have rolled Order for sure. You can also read all about the Slayer in there and how the community feels about them as a whole. I have to ask though, did Mythic really send this? If it is true then they have resparked my fire to play this game again. Alright, I play a Black Orc and even to me this is exciting. If they are releasing Slayers.. I’ll be making an order alt for sure. If this is what we’re all assuming it is (and it seems likely to be), I’d say this has to be one of the most original methods of hinting about what’s in a patch that I’ve EVER seen. Kudos to Mythic for thinking outside the box. Also, I shall probably end up bidding destruction a fond farewell. This is pretty awesome. Together with the other signs (hammers for Ironbreakers and scapping hammerer) I’d be very dissapointed if they don’t ad slayers now. Well if the dwarfs get the slayer, then that’s going to be very good for order populations. Very excited about a slayer. Since we know it’s not going to be a hammerer, then roll on the end of the month. At least a sense of humour has been shown by Mythic. One of you should probably use it and make a mohawk 😉 Send the picture back to Mythic and maybe they’ll give you more prezzies! I guess clippers could mean the Choppa because greenskins have no hair (you use clippers to shave your head) but I have a feeling they’re both for the Slayer. Well, if the slayer get’s released, the choppa or similar alternative will be too. No way mythic will allow themselves to have more classes in on side than in the other. Oh absolutely mate, I was just saying this will refer to them dropping the Hammerer. We’ll defo get the Choppa as well, no need to change that class really. May be a bland question, all things considered, but did they take your address from your credit card information? It’s quite the smooth move either way, the rational side of me wonders about such tiny things. IMO we’ll defo get the Choppa as well, no need to change that class really. @Proximo: I know it’s from Mythic because I was expecting something from them due to the address request. It’s definitely legit. Part of me is wondering if it has anything to do with the Slayer at all. Maybe there’s more to it than meets the eye. 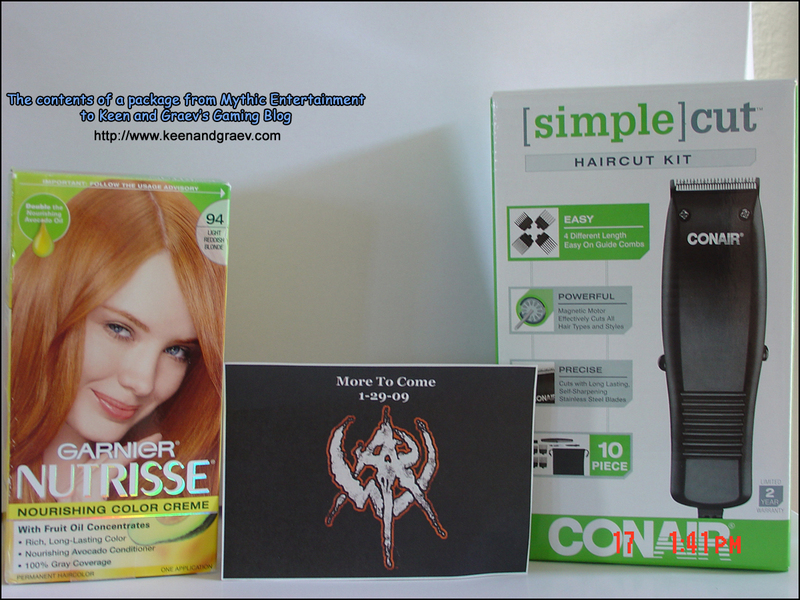 The obvious solution to the mysterious package contents at first glance was a barber shop of sorts like WoW has, but further thinking led us to believe it was the a hint that the Slayer is coming. The orange hair dye is very obvious but the hair cut kit is what still has be wondering. I believe he refers to the fact that death in the game is just a mechanic. No one really dies, as resurrection left and right is not part of the lore. Well, to answer Ryvvers question the “death oath” aspect is two fold, because the main slayer feature is trying to find a glorious death in battle and all that, but seeing as no one in the game ever dies…. Just saying… BUT also to address that, if you check the dwarf forum on warhammer alliance there is a big run down. First I’ll address what you didn’t say, slayer’s are loners therefore would not make sense in parties. Well, it can be shown wrong as even the most popular slayer uses parties of others to get to bigger and badder beings. The death oath is simple as pie. I believe it was in orcslayer Gotrek puts the death oath on hold to fullfill oaths taken that when fullfilled could mean the survival of his kin. Any oath that can do that, save the dwarf kin and preserve the race have to be upheld until fulfillment and before attempting the Slayer Oath. Now… the dwarven army in game is called the Oathbearers right??? Wonder why…. It has got to be the slayer, if not, I will sacrifice Paul..
As a dwarf I know grugni would not be pleased. oh, and keen… the dwarf HAS to cut his hair to become a slayer. In fact the shaving of the head is one of the most important aspects, and is an act that shows a Dwarf is a slayer, and in my opinion the ACT of cutting the hair is just as important if not more so then the color.. Cool, that clears it up for me Drewsipher. 🙂 Definitely looks like the Slayer then. bah, lost my comment so will redo it anyway. If Mythic wanted to really hurt themselves all they would have to do is incline that a class that so many people want in the game was coming out with this parcel and then not release it… imagine the uproar! I hope they introduce the Slayers, That means one thing for me. More Blood for the Blood God!!!! I wish they would send me some clippers. My 10 year old clippers are getting mighty dull. LOL. Very cool. a choppa with a razor though! Eeeeeekkkkk!! the cutting of the hair is a very key event for the slayer. i believe part of the slayer ceremony is taking that cut hair to a shrine of Grimnir and burn it. OK this really would ruin the warhammer lore if they introduced slayers because in the Warhammer Universe slayers are few and far between and we all know if that class was introduced then everyone and there mom will be a slayer, and it would ruin it for me if you want my honest opinion. One of the main reasons why I bought and support this game is because of the LORE of the Warhammer Universe, it doesn’t make since that game workshops would let mythic do this… Very disapointing =(, and another thing, slayers dont wear armor at all, so what are they gonna do about that too? I’m very skeptical about this and hope mythic doesn’t go through with it. Peace! slayers DO NOT BREAK LORE. there have been entire slayer armies. they have their own keep & king.also other oaths take priority over the slayer oath. It’s the Slayer. At this point Mythic knows that will help bring some people back, or keep others. I will resub if they release the Choppa. I know Karak Kadrin is the slayer capital… I’ve read both omnibus’s and Manslayer so I know all about slayers.I didn’t say they break lore I simply said if they were introduced into this game that EVERYONE would wanna be one and thus go against the slayer lore because as I before mentioned in the warhammer universe, outside of Karak Kadrin SLAYERS ARE FEW AND FAR BETWEEN and on top of that there LOANERS whose only companions are there rememberers (And Snorri Nosebiter of course LoL). Also about the Slayer army, that was a long time ago in the Warhammer lore and will never happen again because there are fewer Slayers in this time period and fewer dwarfs because they are a dieing race. I’ve also been playing Warhammer Tabletop since I was 12… I’m 25 now SO I think i know what I’m talking about Skalf so please don’t try to school me on something that I’ve been following for 13 years now. I guess that makes me Anti-slayer. Within the game, Slayers’ level of ability is noted by the most dangerous creature they have survived fighting against – moving up through the progression of Troll Slayer, Giant Slayer, Dragon Slayer, and Daemon Slayer. It is quite common for young Dwarf Troll Slayers to band together, usually with a veteran Dwarf Slayer as their leader, typically a Dragon or Daemon Slayer. Together, they will seek great dooms together and tackle monsters of great power. It is worth noting that there are an extremely small amount of Daemon Slayers, as most Slayers seeking their doom from Dragons and Daemons soon find it…. Question, how are you supposed to find your doom if you never die (well you do but shortly after you respawn or are rez’d by a healer) and slayers stick with slayers so how does that stick to the lore? Another example of why slayers shouldn’t be in WAR. If the slayer is coming.. will we be able to change our existing career lvl x eng/ib/rp to a slayer, thereby not having to start all over at level 1? that would make sense to me.. How could a dwarf just starting out in the world have already done something so shameful as to begin life as a slayer? makes no sense. You are trying to make the complaint about them being out in abundance now when Mythic faced the same exact issue with Male Sorcs. Guess what? Male Sorcs made it into the game despite being something that should be very rare. Guess what else Mythic has done? They tweaked the Marauder, made a Zealot, made a Disciple of Khaine, made a Rune Priest, allowed WP to have hair, among many other things. These are all lore breaches, but are in the game. About the Slayer ressing, show me any lore example where a Witch Hunter comes back to life, or an Ironbreaker for example. You can’t. Ressing in an MMORPG is a mechanic, nothing less, nothing more. Dont forget when we start out in this game we arent just come peon or citizen, we are alreadya semi champion, stronge than the normal but weaker than the abnormal. Take a look at the Gotrek and Felix novels for some insight into slayer culture. A slayer can have had any shame, maybe he was a barber before he accidentally burnt his whole dwarf hold and shaved his head for his sins. A slayer can be born from anything. I’ll see tier 4 .. some day. However that day is not now. I did expect something like this after the slayer announcement on the 17th. Still this makes me excited! BTW ..Great PR move Mythic. Funny I always just assumed it was Choppa + Slayer. What even is a hammerer? War-hammer-er-er? Whatever it is I’m glad I won’t have to kill it. Bring on the crazy nekkid stunties!